The Kuching Marathon 2018 official Logo. The Annual Kuching Marathon is back ! This year is the 5th Kuching Marathon annual episode since it was first started on 17 August 2014. The run will takes place around Kuching City, passing various historic landmarks in Kuching. Join in with more than ten thousand of runners in this event and enjoy the run ! Motto : Let’s Run Cat City! The Kuching Marathon is part of the Great Borneo Series and is the last station of the series. The Great Borneo Series is a platform that give recognition to marathon runners who completed the three major cities marathon event in island of Borneo. Started of in Miri City Sarawak (Miri Marathon 2018 on 18 March 2018) then Kota Kinabalu Sabah (Borneo Marathon 2018 on 6th May 2018) then ends with Kuching City Sarawak(Kuching Marathon 2018 on 12th August 2018) , with total distance 126.585 KM being run. Below are some of the information and photos of the Kuching Marathon 2018. The 42KM Full Marathon route meets the international standard of Full Marathon. The minimum age for the participant of Full Marathon is 18 years and above. This route will take runners through both northern and southern administrative centers of Kuching City. This route will challenge the endurance of the runner to its maximum. Along the route, runners will pass by several famous landmarks in Kuching City, including the Padang Merdeka, Astana and DUN (State Legislative Building) , The Cat Museum and DBKU (Kuching North City Hall), Borneo Convention Center Kuching, MBKS (Kuching South City Hall) , Jalan Padungan and the Cat statue. The Full Marathon starts off at 1:00 AM with the cut-off time of 7 hours (by 8:00 AM). If Full Marathon test the runners endurance to its maximum capability, those who have lesser endurance can try out the Half Marathon (21km). It is half of the distance, but the route will still take runners through both northern and southern administrative centers of Kuching City. The minimum age for the participant of Half Marathon is 16 years and above. 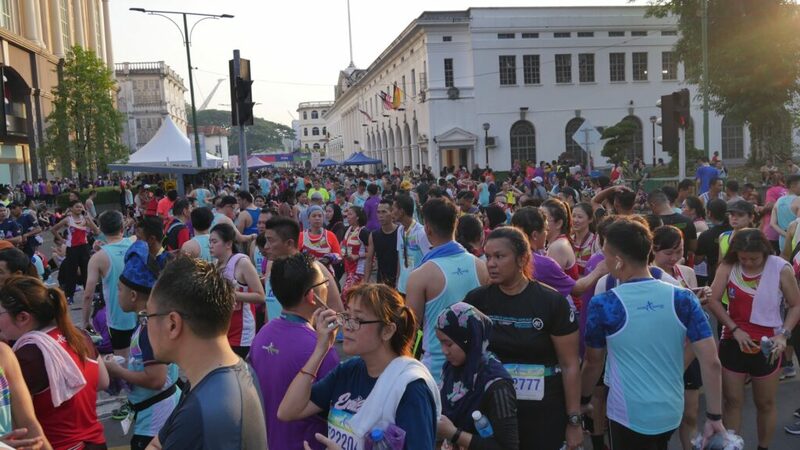 Along the route, runners will pass by several famous landmarks in Kuching City, including the Padang Merdeka, Astana and DUN (State Legislative Building) , MBKS (Kuching South City Hall) , Jalan Padungan and the Cat statue. The Full Marathon starts off at 4:00 AM with the cut-off time of 3 hours 30 minutes (by 7:30 AM). This is the moderate endurance run that suits most of the average folks. The minimum age for the participant of 10KM run is 15 years and above. With less than a quarter of a Full Marathon, this course will take runners around several famous landmarks along the waterfront of Kuching City. The 10KM run starts off at 5:30 AM with the cut-off time of 2 hours (by 7:30 AM). The 5KM run is generally regard as fun run. This low to moderate endurance route is good for routine exercise for the family. They allow participants of 7 years old and above. Participants aged 7 years old or below must accompanied by parents or guardian who is participant of 21 years old or older. The 5KM run starts off at 6:30 AM with the cut-off time of 1 hour (by 7:30 AM). Information extracted from the “KM2018 Runners E-Guidebook”. There will be several partial road blocks around the Kuching City area and road related to the racing route. Follow the orders of the local authorities and police officers at all times. Jalan Tun Abg Hj. Openg, Jalan Pearl, Jalan Barrack and Jalan Wawasan will be closed as early as 11th August 2018 for preparation of the Starting and Finishing points. This year’s Kuching Marathon is one of the biggest ever held in kuching, with total participants of more than 10,000 people in all categories. The participant ranging from local to international, with remarkable more than 800 international runners joining this event. Early at 12 midnight, marathon runners are already gathered and start their early warming up around the padang merdeka. More than thousands participants waiting anxiously for the flag off at 1AM. Police, cadets, medical and volunteers had stationed themselves around the route to facilitate the smooth process of the events. All volunteers are ready to depart. The human barricades to prevent participants crossing the digital mat at the starting line, which will disqualify the participants timer chip if cross before the flag offs. Every participants have a disposable timer chip on the them to validate the time record for the Marathon race. Due to mass numbers of participants, the actual time crossing between the starting and finishing line is count for official record (and record breakers) instead of gun time (flag off). Participants are very happy to be part of the great event. Thousands of participants are waiting anxiously. The flag off of the 42KM Marathon starts exactly at 1AM. With the countdown of ten, and the fire of the horn and gun, participants of the 42KM Full Marathon embarks the journey around Kuching City towards to be the winner and finisher of the great Marathon event. The VIPs are ready for the flag off ceremony. With the sounding of the horn and firing of the gun, the Kuching Marathon 2018 for the 42KM full marathon is officially started. Thousands of runners navigate their route in the Kuching City roads. The 42KM Full Marathon had breed a spectacular time record with a record breaking 2hrs 20mins marking the new record for Kuching Marathon event. Previous year, the record is 2hrs 26mins. Just as the Full Marathon runners slowly returning from their 42KM journey, the 21KM half marathon runners are warm up and ready for flag off. Barricades before the starting line. Cheerleading at the final 2KM. The 5KM fun run is back. The winners are seated and ready. Very friendly host and Master of Ceremony. Crowd returning from the run. Winners for 10KM women open. Winners for 10KM men open. Winners for 21KM half marathon women veteran. Winners of the 21KM half marathon men veteran. Winners for the 21KM half marathon women open. Winners for the 21KM half marathon men open. Winners for the 42KM Full Marathon women veteran. Winners for the 42KM Full Marathon men veteran. Winners for the 42KM Full Marathon women national. Winners for the 42KM Full Marathon men national. Winners for the 42KM Full Marathon women open. Winners for the 42KM Full Marathon men open. All three of them have break the last year time records. The Kuching Marathon 2018 is officially closed by 9AM. There will be next episode next year on 18th August 2019. See you again next year. The Official Sponsors of the Kuching Marathon 2018.